Wireless high speed internet, Tea/coffee making facilities, Panoramic views of the garden, TV and DVD player, Satellite Channels to include Indian, Arabic and other Multinational and local channels, Fully Equipped Kitchen to include Microwave oven, Electric oven and cookers, crockery and cutlery, and Fridge, Voltage of 240/220. Queen or King beds available. 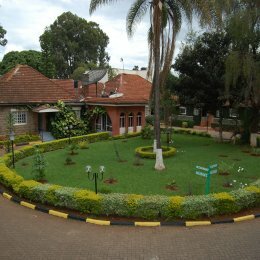 Located along Rhapta road within the heart of Westlands with easy access to the Central Business District, Westlands Business Area, International organization, Financial Institutions and other offices. Our Hotel Provides a serene garden environment that provides a warm breath of fresh air. The hotel has a relaxing environment that offers the tranquility and feeling of being home away from home. Royal Kitchen Restaurant in the hotel offers delicious meals with a mouth watering A-La-carte menu of up to 400 items to sample from. A variety of Chinese food such as chicken lollipop with honey, Indian foods such as Mutton Sheikh Kebab roll, Continental foods such as Grilled pepper steak, Italian foods such as fungi Tripolatti, different international cuisines, homemade delicious barbecue, various juices and milkshakes just to mention a few. The Royal Kitchen also offers you the chance of a private dining facility where the hotel's master chefs prepare the finest mixture of exotic cuisines to suit your tastes. A round table facility can be set up for up to 100 people. It was good and definitely met our expectations. Can't really complain. I love SleepOut and the website is very excellent as I have used it severally before. However I had the worst experience booking Pride Inn Raphta. First they did not honor the reservation. When we called on the check in day they told us that they were fully booked and that they could not offer a room with the rate of USD 82 as quoted on SleepOut's website. They sent us to Pride Inn Westlands who had rooms available but could also not offer it at that rate. They suggested I go to Pride Inn Lantana who agreed to host me. It was the most hectic day ever. Was not impressed at all. Anyway Pride Inn Lantana was okey.